Prominent & Leading Manufacturer from Rajkot, we offer phosphorus bronze bushes. Our firm is managing in the assembling and supplying of Phosphorus Bronze bushes. The offered bronze bushing is known for outstanding hardness, needed to hold the rotor weight and mechanical strain. 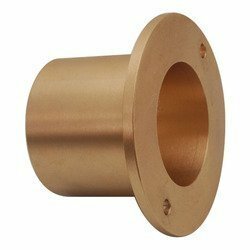 Our offered bronze bushing is made additional hard for utilizing it as a heading surface. The offered bronze bushing is perfect for hard and substantial rotor applications. Our offered bronze bushing has the capacity hold and bear substantial weight.